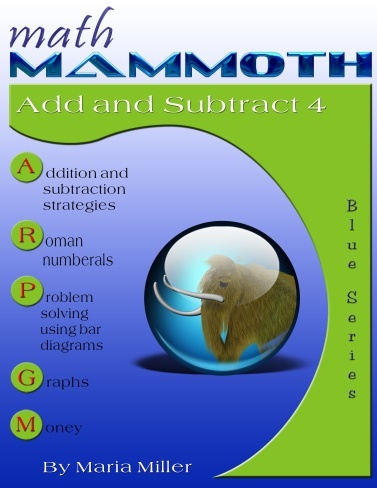 Math Mammoth Add & Subtract 4 - printable workbook for third or fourth grade. 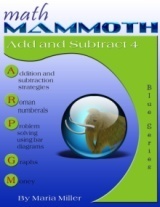 The lessons in this book are taken from the first chapter of Math Mammoth Grade 4 Complete Curriculum. Some of the lessons are even useful for 5th grade students, especially if they have not had much exposure to word problems, the order of operations, and applications of addition and subtraction. At first, we review the "technical aspects" of adding and subtracting: mental math techniques and adding and subtracting in columns. We also study some patterns. The lesson on Pascal's triangle is intended to be fun and fascinating—after all, Pascal's triangle is full of patterns! In the next lesson, we study the connection between addition and subtraction and bar models. Bar models help students write addition and subtraction sentences with unknowns, and solve them. This is teaching the students algebraic thinking: how to write and solve simple equations. The lesson on the order of operations contains some review, but we also study connecting the topic with real-life situations (such as shopping). Here, the student writes the mathematical expression (number sentence) for word problems, which again, practices algebraic thinking. Going towards applications of math, the book then contains straightforward lessons on bar graphs, line graphs, rounding, estimating, and money problems.